Post Thanksgiving exhaustion kicked in? You won’t want to sleep through our next exhibition! If you missed KEENDESIGN’s product showcase at SEMA 2017, have no fear! KEENDESIGN will be exhibiting at the L.A. Auto Show in the L.A. Convention Center from Dec. 1st-10th. 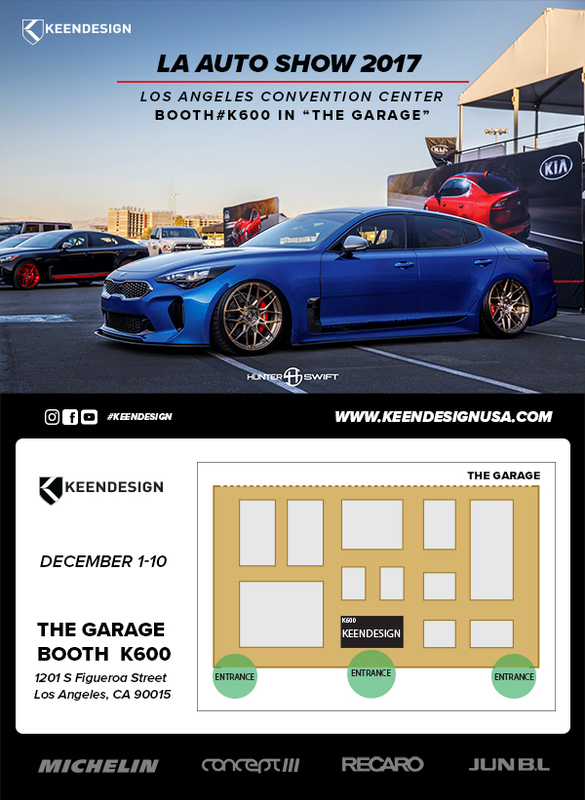 Take a few minutes and stop by our Booth #K600 in "The Garage" and meet our lovely model, Ms. Rebecca Abbitt (@rebecca_abbitt) during opening weekend Dec. 1st-3rd and behold our two KEENDESIGN sponsored vehicles! We will have a blue Kia Stinger GT on display showcasing a staggered setup featuring custom 20” KEENDESIGN wheels as well as Concept 3’s (@concept3) Kia Optima “Kikimama” showcasing our 19” KD-06 wheels. Want a sneak peak of the cars and products you will see on display at the show? Head over to our Instagram, @keen.design and receive some behind the scenes footage of this year’s 2017 L.A. Auto Show! For more information regarding KEENDESIGN’s products and upcoming events, please visit keendesignusa.com or stay in the loop with us on Facebook @KeenDesignUSA!